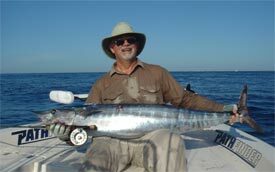 The wahoo's body is covered with small scales and is steel blue above and pale blue below. It has a series of 25 to 30 irregular blackish-blue vertical bars on the sides. The fish has a large mouth with strong, triangular, compressed and finely serrate teeth. Its snout is about as long as the rest of the head. The maximum reported size for wahoo is an IGFA World Record: 184 pounds (83.46 kg). Wahoo commonly attain sizes between 40 and 65 inches (101-165 cm) in length, with maximum size reaching 98 inches (249 cm). Rapid for the first year or two of life. Wahoo are found in tropical and subtropical waters of the Atlantic, Pacific, and Indian Oceans. Wahoo inhabit the pelagic area of tropical and subtropical waters. It is believed wahoo live up to 5 or 6 years. Wahoo are voracious predators, feeding on fishes such as mackerels, butterfishes, porcupine fishes, round herrings, scads, jacks, pompanos, and flying fishes. They generally compete for the same kind of food as highly migratory tuna. Wahoo mature at approximately 2 years of age. Males mature at 34 inches (86 cm) and females mature at 40 inches (101.6 cm). A study from Louisiana and the Bahamas showed that males as small as 7 pounds (3.2 kg) and females as small as 12 pounds (5.5 kg) were sexually mature. Individual females may spawn many times during the season at short intervals.Wahoo from North Carolina have 560,000 eggs (for a 13.52 pound (6.1 kg) wahoo) to 45 millions eggs (for an 87.1 pound (39.6 kg) wahoo). May through October. They are thought to spawn year-round in the tropics and seasonally in the subtropics. Wahoo tend to be year-round residents in tropical waters, but they expand their range to more northern latitudes during the summer months. If wahoo migrate, an indication of just how far they can travel was provided by the recapture of a tagged fish in the Pacific. The wahoo was recaptured 6.5 months following capture, 1,707 miles (2,747 km) away. Young wahoo are prey for predators that inhabit the upper surface layer of tropical and subtropical oceans.